A vacuum motor contains a set of fans mounted internally which pull air to create vacuum uplift. These fans are known as stages. The more stages a vacuum motor contains, the more power is generated. Why Ashbys Ninja achieves the driest possible results We concentrate power into our vacuum systems by mounting our double vacuum motors in-series, so that the second vacuum motor pulls through the first, dramatically increasing the suction power. This doesn’t happen with any other vacuum system. Clean fast, thoroughly and without moving your machine We use this increased vacuum power to pull air through the material or fibres being cleaned. Without the power to pull air long distances through multiple hose sets, narrow vacuum slots on cleaning tools and the item being cleaned, there can be no fast air movement which is needed to remove soilage and cleaning solution. Remember - the more powerful your vacuum, the more effective the clean. A - Heavy Duty 3 Stage Vacuum Motor. B - 2 x Heavy Duty 3 Stage Vacuum Motor mounted in parallel. C - Ashbys Heavy Duty 3 Stage Dual In-Series Vacuum System PC5866. D - Ashbys Heavy Duty 3 Stage Dual In-Series Vacuum System PC5866 plus Vac Booster Adaption. Hangs on the rear handle and links to the vacuum exhaust of Ashbys Ninja, Diamondback or Sensei to give an additional in-series 3 stage vacuum motor. Provides incredible vacuum power for faster, drier more thorough cleaning and use with longer hose lengths. Add the Vac Booster Adaption PC6647 and increase your vacuum strength to an incredible 283 inches of water lift / 21 inches of mercury lift. 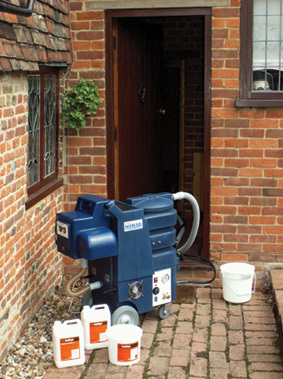 Get carpets drier and cleaner with a more thorough extraction. Will operate up to 400 ft / 122 metres of vacuum hose. 1 x 3 stage heavy duty vacuum motor plus 1 x 3 stage standard vacuum motor. The best permissible vacuum motor arrangement for top performance. 230 inches of water lift / 17 inches of mercury lift. Will operate up to 200 ft / 61 metres of vacuum hose. 2 x 3 stage standard vacuum motors. 220 inches of water lift / 16.2 inches of mercury lift. Will operate up to 175 ft / 53.3 metres of vacuum hose. 2 x 2 stage vacuum motors. 185 inches of water lift / 13.6 inches of mercury lift. Will operate up to 50 ft / 15.2 m of vacuum hose.